The large Army air bases are fifteen miles from where I am near the giant naval station, but the bombers can be heard before they even get airborne. The insistent hum from thousands of cylinders in hundreds of radial engines shoves through the few gaps in the range of hills that cover Guam. The hum becomes an angry buzz as the engines rev and the 200 inch diameter propellers rip into the warm evening air, pulling the planes in close groups down parallel runways. The sound sharpens and takes focus as pairs of bombers come into view past the hills that had hidden them, slowly climbing over the water. The evening sun warms each shiny silver bird with a fiery orange hue. I think it must look much the same when they circle back over a freshly fire-bombed city, widespread fires lighting up the sky as the injured city calls out her attackers in the sky. The planes turn and continue climbing, moving to where they will meet bomber groups from the other islands. On each mission dozens or hundreds of planes from Guam meet a similar number from Tinian and/or Saipan. 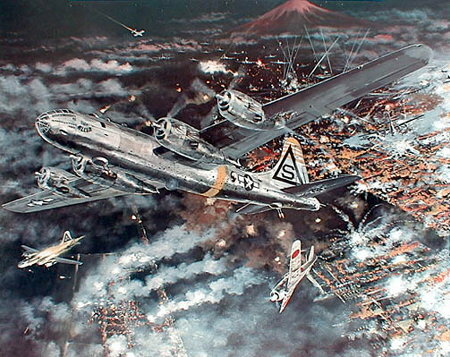 Together they pick up dozens or hundreds of fighter escorts near Iwo Jima. The whole force moves toward Japan, where it will either split up or focus on just one large or important target. At night aiming points are found by radar. Coast line features, river junctions, and large landmarks show up well on even the most basic set. Thankfully Japanese defense radar and night fighters haven’t been very effective so far. That was a big unknown when the Army Air Force first started night bombing runs last spring, and at that time they had no option of fighter cover.